Capital of Madre de Dios department and Tambopata province, founded in 1902, it's located at the confluence of the Madre de Dios and Tambopata rivers, in southern Amazon rainforest in Peru, 610 feet (186 m) above sea level. Their inhabitants are predominantly descendants of native forest tribes engaged in tasks of extraction of natural resources, in recent years large population of Andean migrants caused by gold dredging has generated serious environmental problems. The main economic activities are rubber, logging, gold mining, oil exploration, timber industry, Brazil nut collecting and tourism. 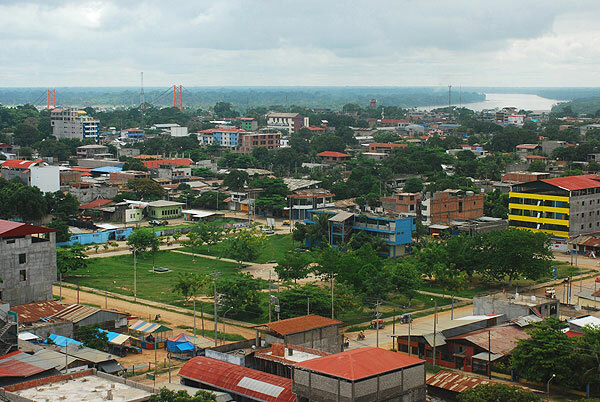 The small town of delayed economic development, with mud streets, has hotels, restaurants with local cuisine, bars, discos, banks, basic public services, river port and an airport, and offers lively nightlife and an excellent opportunity to take a pleasant break both before and after taking trips to the jungle. Normally is only the jumping-off point for exploring the jungle and journeys along Tambopata river and lower part of the Madre de Dios river and the visits to Sandoval and Valencia lakes. Different areas where stores can be found in Puerto Maldonado. Among them, there are near to the Main Square and the airport. Fiesta de San Juan: June 24th. Feast with local bands, dances and try typical food. The festival of Saint John the Baptist is symbolic, since water is celebrated as a vital element in the entire Amazon region. People can listen to local bands and sample typical food from this region. Anniversary of Puerto Maldonado: July 10th. Over the course of a week, competitions such as regattas and motorcycle races, food tastings and beauty queen contests, are held. .
Madre de Dios Anniversary: The most important festival in the region, where celebrations begin the night before with parties, songs and dances. On 26 December there are civic parades, sporting championships and craft fairs. The city of Puerto Maldonado has a hot, wet climate all year round, apart from in June and July, when temperatures can fall thanks to the “El friaje” phenomenon caused by winds blowing from the South (Patagonia) up to the Amazon. The rainy season lasts from November to April. In the towns and villages in the province of Manu the climate is temperate and wet, with high humidity and fog in the mornings; there is more rain in these highland rainforest areas than in the lowland rainforest areas. 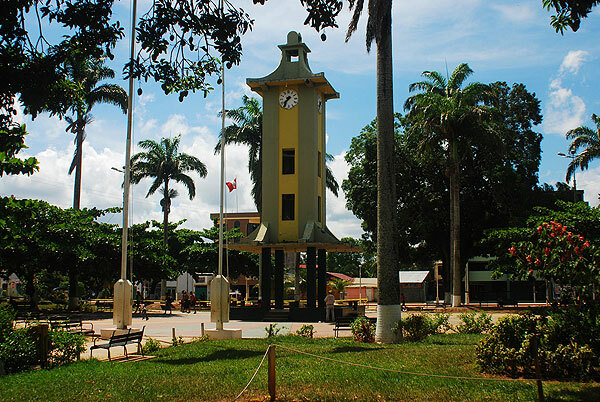 One of the main destinations in Madre de Dios. A oxbow lake, amazing lakescapes, around 3 Km long, 1 Km wide and 3 metres deep. Its waters have an average temperature of 26ºC (78.8 ºF) and hold a wealth of fish species. Surrounded by huge areas of wetlands (aguajales), these swampy areas are where the aguaje palm trees grow, among other exotic species. Highlights of the flora here include orchids, heliconias (platanillos or parrot beaks), ungurahuis palm trees, kapok trees (lupunas), Caoba trees and Mauritian palm trees that reach heights of up to 30 metres. It is a habitat that is home to a wide variety of birds, including cormorants, toucans, macaws, parrots, camungos and herons, as well as a colourful species of wild chicken known as the “hoatzin” or “shansho”, whose head is crowned with feathers. There are also tapirs, turtles and otters or “river wolves”, as well as many species of lizard, including the black caiman. Located 10 Km (6 miles) from Puerto Maldonado (25 minutes by a 55 HP riverboat). To reach the lake, you must take a riverboat and then walk 5 Km (3 miles) east from the shore of the Madre de Dios river to the interior (1 hour and 30 minutes). 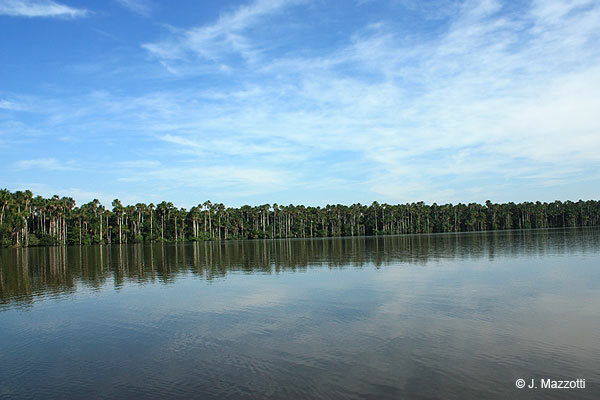 The Sandoval Lake is inside of Tambopata National Reserve. A 15-kilometre oxbow lake, 800 metres wide and 15 metres deep, this is a very special area due to the presence of trees such as the pumaquiro, quinilla, cedar, lupuna (kapok), palm and chestnut. Highlights of the local wildlife include bush turkeys, turtles (charapa and motelo varieties), lizards, monkeys, cormorants and herons. 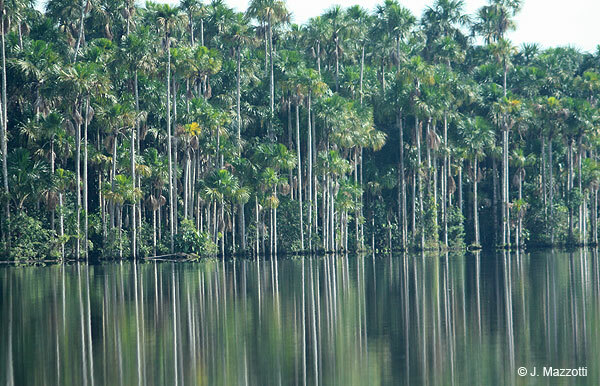 The wealth of its waters allows both the native population, the Huarayo, and the settlers nearby to fish for wrasse, palomenta (bonefish), carp, piranhas and araipama (paiche), the latter being a species that was introduced into the lake. Another regional occupation chestnut harvesting. 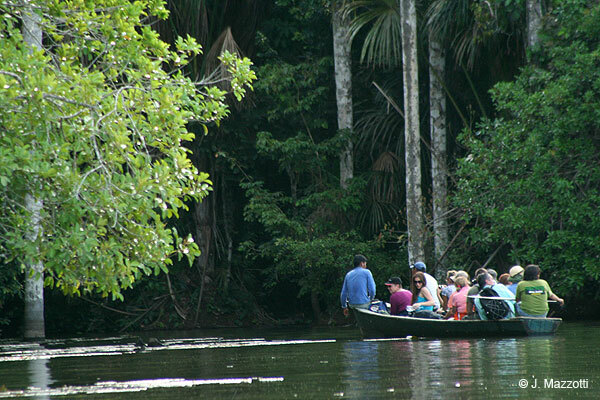 Located 60 Km (37 miles) northeast from Puerto Maldonado by the Madre de Dios river (4 hours by 55 HP riverboat).